If you explore the area, you will soon believe the lake was created just to sell bridges and to slow traffic. That’s what happens when you create roads first, then you fill the valleys with water. The location of Lake Allatoona isn’t easy to describe. It is mostly in Cherokee County; however, a significant part is in southeastern Bartow County. A smaller section is in Cobb County, not far from Acworth. Much of the north side of the lake remains gracefully undeveloped. Cartersville, on I-75, is the largest town near to the dam. The drive to the dam is surprising long. That’s because (hello?) you must drive around the fingers of the lake to get there. Red Top Mountain State Park, in the foothills of the Blue Ridge Mountains, is close enough from the world’s busiest airport that you can see planes descend for landings. The Atlanta airport and Lake Allatoona, however, are about an hour apart and a world apart. 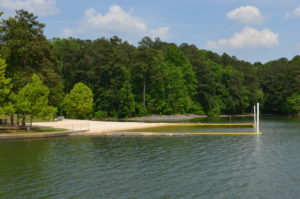 Lake Allatoona has 270 miles of shoreline and 12,000 acres of water filled with bass and bliss. You are invited to visit all year long for vacations, boating, fishing, camping and romance.